Among 16 applicants the one from Seattle succeeded. Kevin Gray worked at the Hochschule Bonn-Rhein-Sieg an Mesenchymal Stem Cells within the group of Edda Tobiasch with Fatma Elsayed. He improved speaking the German language and got fabulous impressions of the country. The DAAD Research Internships in Science and Engineering program (RISE) offers unique opportunities for bachelor students to work with PhD students in Germany who serve as their mentors in a period of 2 or 3 months. This year the Lab of Molecular Genetics and Stem Cell Biology at the department of Natural Sciences on the Rheinbach campus was successful in acquiring an intern via the RISE program. The group of Prof. Dr. Edda Tobiasch had received 16 applications from undergraduate students. They were from some excellent universities such as Harvard University, Texas at Dallas University in US, and Edinburgh University in Scotland, UK. After a tight selection, Kevin Gray was selected to be the RISE scholar this year. 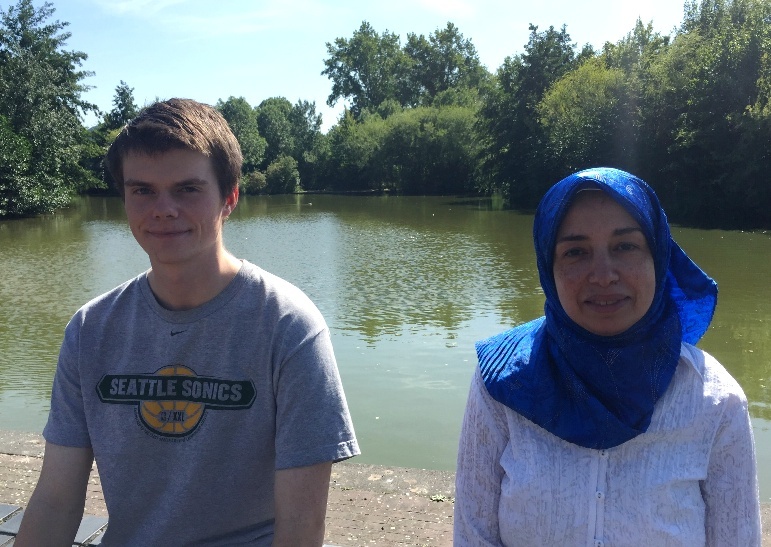 During this summer, Kevin is working with Fatma Elsayed on the project entitled “Characterization of Human Stem Cells for Tissue Engineering”. They are working together for 12 weeks from the end of June to the end of September. Kevin is a third year student studying Bioengineering at the University of Washington, Seattle. His project involves applying his tissue engineering experience to Mesenchymal Stem Cells (MSCs) to improve their potential for bone regeneration. Having no prior practical experience with MSCs, he will learn how to isolate, differentiate, and characterize them and their derivatives within three-dimensional constructs during his stay. He will also apply these techniques to investigate novel ways of bolstering these cells’ utility for regenerative applications. During his stay, he had visited Heidelberg and in the coming weekends he intend to travel to the east and explore around the Dresden area, where a part of his family has its roots.